CAIRO (CNS) — The only kind of fanaticism that is acceptable to God is being fanatical about loving and helping others, Pope Francis said on his final day in Egypt. The pope celebrated an open-air Mass April 29 in Cairo’s Air Defense Stadium, built by the anti-aircraft branch of the Egyptian armed forces. The pope concelebrated with Coptic Catholic Patriarch Ibrahim Isaac Sedrak of Alexandria and leaders of the other Catholic rites in Egypt. After spending the first day of his visit in meetings with Muslim leaders, government officials, diplomats and members of the Coptic Orthodox Church, the pope dedicated the second day of his trip to Egypt’s minority Catholic community. Arriving at the stadium in a blue Fiat, the pope was slowly driven around the stadium’s red running track in a small and low golf cart, far from the estimated 15,000 people seated in the stands high above. Yellow balloons and a long chain of blue balloons tied together like a rosary were released into the sky as a military helicopter circled high above the venue. Helicopter gunships circled the perimeter of the stadium, while military jeeps patrolled Cairo’s streets. Surrounded by security, the pope managed to personally greet only one small group of children who were dressed as pharaohs and other traditional figures. They hugged the pope affectionately as security tightly closed in on the group. In his homily, the pope used the day’s Gospel reading of the two disciples’ journey to Emmaus to highlight how easy it is to feel disappointment, despair and defeat when one is trapped by a false notion of who God really is. The disciples could not believe that the one who could raise others from the dead and heal the sick could “end up on hanging on the cross of shame,” the pope said. Believing Jesus was dead, all their dreams died with him on the cross and were buried in the tomb. Like the disciples, he said, Christians will never recognize the true face of God until they let their mistaken ideas die on the cross, rise up from the tomb of their limited understanding and shatter their hardened hearts like the “breaking of the bread” in the Eucharist. “We cannot encounter God without first crucifying our narrow notions of a god who reflects only our own understanding of omnipotence and power,” the pope said. True faith “makes us see the other not as an enemy to be overcome, but a brother or sister to be loved, served and helped,” he said, and it leads to dialogue and respect and the courage to defend the rights and dignity of everyone, not just oneself. “God is pleased only by a faith that is proclaimed by our lives, for the only fanaticism believers can have is that of charity. Any other fanaticism does not come from God and is not pleasing to him,” he said. The warm welcome Pope Francis received from so many political and religious components of Egyptian society “is a message to the world that confirms Egypt’s nature” as a lover of peace that seeks to affirm peace in the Middle East and the world, the patriarch said. 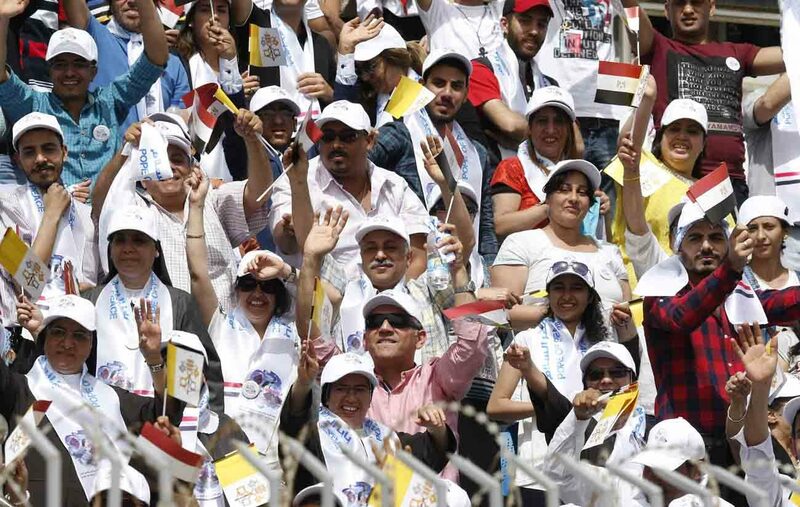 Later in the day, before his departure for Rome, the pope met with about 1,500 priests, seminarians and religious men and women for a prayer service on the sports field of a Coptic Catholic seminary in Cairo. “Although there are many reasons to be discouraged, amid many prophets of destruction and condemnation, and so many negative and despairing voices, may you be a positive force, salt and light for this society,” he told them. But to be builders of hope, dialogue and harmony, he said, they must not give in to the many temptations that come each day, including the temptation to expect gratitude from those they must serve and lead. A good shepherd, Pope Francis said, consoles even when he is broken-hearted and is always a father, even when his children are ungrateful. Don’t become like Pharaoh either with a heart hardened by a sense of superiority, lording over others, expecting to be served and not serve, the pope said.